It doesn't matter if you're studying with traditional printed course materials or Online as you can securely access all of your training materials and data anytime from anywhere in the world from Mac, PC, iPhone, iPad & Android. We understand that people learn differently so we have many study options available. Learning Cloud provides a rich learning experience for our students. All of our learning materials use rich multimedia and interactive self tests that are designed to be fun and to keep you engaged. People learn better when they are having fun and thats what Learning Cloud is all about. So what do you get when you study with Learning Cloud Australia? Course materials that you can take anywhere. All of our learning programs work beautifully across all devices and when you get tired of the screen, you will also have all of your printed and bound materials as well. Amazing trainers! Our trainers and program developers are here to help you around the clock and know how to make learning fun. An amazing learning experience. All of our courses and programs are designed to be fun, interactive, easy to use and suit multiple learning styles. When you're online using the Learning Cloud portal, you're protected by strong SSL security and all of your training data is stored on our secure servers which are backed up regularly to multiple locations. You're Learning Cloud materials work beautifully on your favourite desktop or laptop computer and selected mobile devices. You won't need to worry about your training as we will send you alerts and reminders when assignments are due. The Learning Cloud portal is a hosted online training system so there are no software downloads required to use the system. Learning Cloud's Learning Management System is built to manage and deliver courses online so it makes sense that you can access all of your training information from wherever you have access to the internet. Messaging makes it easy to keep in touch with your trainees & receive automated alerts. For businesses, easily communicate with large groups of trainees by sending messages out to all members of a team or all of the trainees assigned to a given course. Configure automated notifications to keep yourself informed when certain events happen on during your course. For example: when you complete an assessment or when an assessment is overdue. Any questions a student has while completing a course are delivered directly to your trainer. Optional email integration connects your Learning Cloud messages to your email inbox. In a nutshell, being SCORM certified means that Learning Cloud is up to date with Online Learning. SCORM stands for "Shareable Content Object Reference Model" and it is a set of technical standards developed for eLearning software products. In its essence, SCORM enables interoperability between eLearning software products. Specifically, the model determines how online learning content and Learning Management Systems (LMS) communicate with each other. Back in the nineties, the US government was doing a lot of online training across all of their different departments. Each department operated autonomously developing their own training courses and delivering them via the LMS of their choice. As you can imagine, this led to a lot of content duplication and results located all over the place. Without any standards, there was no interoperability between the various departments' content and all of the proprietary LMSs being used. Therefore, in 1999 the Department of Defence tasked a research group called Advanced Distributed Learning (ADL) with the job of developing a set of standards which later became known as SCORM. What does it mean when it says Learning Cloud is SCORM 1.2 Certified? SCORM 1.2 is one version of the eLearning software standards that have evolved over time. There are currently 3 versions and the latest one has a few different editions. Released in October 2001, SCORM 1.2 is the most common and widely adopted version that will be around for a good, long while to come. 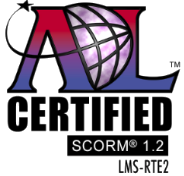 When we say we're SCORM 1.2 Certified, this means that we have sent our product to ADL, it has passed the SCORM 1.2 Edition LMS certification process and ADL has confirmed that we have implemented the SCORM 1.2 standards correctly.